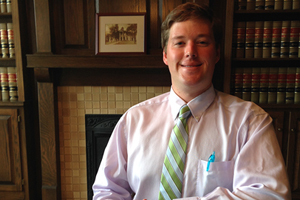 Davis L. Hunter joined Dorsey, Gray, Norment & Hopgood as a law clerk in May of 2012. Upon completing law school, Davis began his legal career as the firm’s newest attorney. Davis represents a wide variety of clients and businesses and maintains a general legal practice including civil defense, insurance law, estates, corporate law, contracts, and catastrophic personal injury. Davis is a native of Morganfield, Kentucky and received his Bachelor of the Arts from Western Kentucky University in 2011. He received his Juris Doctor from the University of Louisville Brandeis School of Law in 2014. Davis is married to former Tara Skaggs of Louisville, Kentucky. He is also a member of the Kentucky Bar Association, Henderson Bar Association, Kentucky Justice Association, Henderson Rotaract, and Kyndle.